I haven't been overly taken with Ann Nocenti's recent DC Comics work (Catwoman, Green Arrow), but there's something about it I find compelling. I am unsure whether her Katana Vol. 1: Soultaker, for instance, suffers from lazy writing, or if there's a thematic imperative in two different characters repeating almost the same line of dialogue four times in the last chapter, whether Nocenti's work is full of poetry or confusion. Katana is a complicated tale of women's lives, love, obsession, subservience, and revenge. Nocenti populates it with characters with vying motives on all sides; there's a lot packed in with ties big and small to Geoff Johns's Justice League of America, Jeff Lemire's Green Arrow, and the Creeper via Dan DiDio's Phantom Stranger. To those ends, Katanta might almost be workable, were it not for the strained (and repetitious) dialogue and what seem to be Nocenti's almost trademark leaps of logic. These elements combine to make a book that's hard to figure. 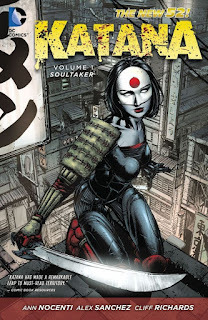 Soultaker starts with Katana Tatsu Yamashiro setting up camp in San Francisco's "Japantown," on the trail of a mysterious tattooed woman, Shun. How and why Katanta finds out about Shun is one of those things Nocenti never quite details, which depending on your point of view is either maddening or a wise exercise in compressed storytelling. Related, Katana's trying to root out corruption in the Sword Clan, part of a shadowy weapons collective called the Outsiders from Lemire's Green Arrow run (think the multi-hued Lantern Corps, done with weapons). The Sword Clan representatives happen to include Sickle, brother of Katana's deceased husband Maseo (now living in Katanta's Soultaker sword), tying it all back to Katana's own origins. Historically Katana has been one of Batman's most trusted allies and a charter member of Batman's (pre-Flashpoint) Outsiders, a martial artist whose husband and children are killed by her husband's jealous Yazuka-connected brother (this book's Sickle). Nocenti's extended origin, however, has Katana loving Sickle but choosing to marry the "safe" Maseo, who turns out to be an assassin, and Tatsu accidentally killing Maseo to protect Sickle when he confronts Maseo about his bad deeds. Nocenti therefore bends our understanding of Katana in a variety of odd ways. The New 52 questioned Katana's very sanity, whether she imagines her husband in her sword; Soultaker proves Katana sane, because ghosts really do live in her sword. At the same time, the dubious answer to Katana's quest across Birds of Prey, Justice League of America, and etc. is that it was she herself who killed her husband, who turns out himself to have been corrupt -- though Nocenti strangely ignores that fact in Katana's continued devotion to Maseo through the rest of the book. Katana's prowess with her namesake weapon is presented as a given here, but from her first training session Katana's actual skill appears lacking, up to and including often triumphing based on her enemies' mistakes; an all-powerful character bores fast, but Nocenti shows Katana as surprisingly easy to defeat. Ostensibly Soultaker is the story of Tatsu, a Japanese woman in a traditional marriage who, upon the death of her husband, finds herself as the sword-wielding Katana; but believing Maseo still alive in her sword, Tatsu vacillates between her new, free life and her old tendencies toward subservience. That would be pretty interesting, and Nocenti parallels that with Shun, kidnapped, tortured, and tattooed by the Sword Clan until Katana inspires her to vengeance, only for Katana to argue in the end that revenge isn't worth it. But Nocenti undercuts this in a variety of (potentially confusing) ways, not the least of which is that even Maseo charges Tatsu with being too obsessed with him in death and needing to move on, and also the whole thread of Maseo actually himself being the very kind of corrupt Swords Clansman that Tatsu mistakenly blames for Maseo's death. Nocenti's Soultaker is a longer, and therefore more intricate, trade than most by a couple of issues because it collects all ten issues of the series. Even so, books even longer (Omega Men, for instance) aren't as hard to understand, including how Katana goes from fighting Sickle and trying to end the Sword Clan's corruption to Sickle providing Katana a series of tests that would result in her leading the Sword Clan. Killer Croc arrives for no clear reason to shatter Katana's Soultaker and then immediately exits the book. The narration and dialogue have repetitious tics, as when Katana thinks that the body-hopping Creeper "picked a drunk to ride" and then immediately asks, "You pick a drunk to ride?" In the span of eight pages, Shun says close variations of "What, no one ever lied to you before?" three times (twice on one page) and another character says it a fourth time. Again, maybe Nocenti's indicating something larger here, but it's not obvious or even implicit what that is. The best part of Soultaker is truly the New 52 Creeper origin, significantly removed as it is from the original "man in a costume" origin to now involving reporter Jack Ryder's possession by a Japanese demon. That part's pretty out there, but in the Villain's Month issue (by Nocenti from a story by DiDio), the Creeper is authentically scary. Moreover the perpetually-drunk, nearly-unhinged Ryder is compelling in the extent to which the demonic possession (and his apparent resurrection from death) is wrecking him. I'm not sure Nocenti did Katana any favors in this book, but I'd be willing to give the story of Jack Ryder's implosion a spin. I credit Ann Nocenti with writing a Katana comic that's more than just the same old thing, and certainly being willing to shake up the Katana character rather than letting what came before be sacrosanct. But I can't decide if Katana Vol. 1: Soultaker ties Katana up in too many knots to continue to be viable (Tatsu now being the very villain she's been pursuing) or if it would be interesting to see Nocenti or another writer try to untie those knots. Credit where it's due, I can say artist Alex Sanchez's work -- sketchy, shadowed, nicely detailed -- definitely provides what's needed for a sword-fighting Katana series. By the time I got to this book, I had already read Nocenti's Green Arrow and Catwoman. I was so disappointed with her writing that by the first two chapters of this book, I was thoroughly disgusted. It was too choppy, and the dialog was horrendous. I loved Gail Simon's portrayal of Tatsu, but I believe Katana (and The Creeper, for that matter) need a complete Rebirth. Have you followed Katana into Suicide Squad? Anything better there? Not yet. I'm waayyy behind on my reading, although I'm looking forward to it. When I first read about it, I remember thinking that she would be a great fit on the team. She was kind of a wild card in Batman's Outsiders back in the '80s.